I’d read Tim Gastineau-Hill’s trip report about Long Gully Canyon in the Bungonia State Conservation Area, and being winter the thought of a dry canyon was quite appealing. 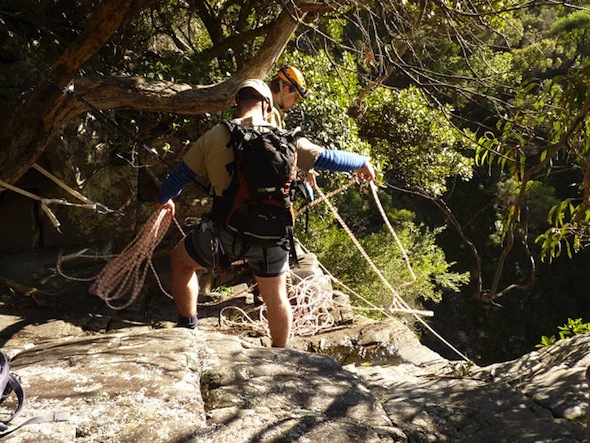 More so, with the description of a 56m abseil and several abseils — smack, bang — following in quick succession. Todd was also experiencing canyoning withdrawal symptoms and signed up for the venture. We put a call out and gathered an experienced party of like-minded individuals, all keen for a fun winter weekend. The plan was to head down early on Saturday morning and do some caving. This was a brilliant suggestion from Tim Vollmer: Bungonia is famous for it’s cave system, one of the deepest in Australia. With no caving experience, I was thankful he volunteered to lead. We would then do Long Gully Canyon on the Sunday. The first hiccup occurred two days before we were due to set off. Our caving leader was struck down with a nasty virus, which meant that the technical caving would not be an option. After days spent looking at photos of caves with narrow constrictions and drops to who knows where, I was secretly a bit relieved that I was off the hook! Knowing the high quotient of adventure seekers within the group, I provided a leave pass — join us on Saturday for bushwalking, Saturday night for a BBQ and/or Sunday only for Long Gully Canyon. The second hiccup occurred on the morning of the trip. I won’t bore you with the details, suffice to say that it was a navigational challenge getting out of Sydney but the upside was that our Italian (Mary), American (Amanda) and Fin (Ulla) all got to enjoy a brief but thrilling view of the Big Potato at Robertson. All agreed that it might be a good idea for me to invest in a SatNav system for the car and not rely upon my iPhone when leaving the Eastern Suburbs. We arrived at Bungonia State Conservation Area around lunchtime and registered at the Ranger Station, where we got our first glimpse of what delights were in store. Within the rangers station was a model which depicted the 300m depth of the Bungonia gorge, with its sheer limestone cliffs. We couldn’t wait to set off. Unfortunately there had been a lot of recent rain, hence the most interesting tracks, the Yellow and the Red Track, also known as the Slot Canyon, were closed. That left only the more popular tracks available to us. We set off on a circuit of the Green, Orange and White tracks. The terrain was undulating with spectacular views of the gorge from a number of lookouts. The Murulan South limestone mine was clearly visible and gave us a unique insight to this park. We had been wondering how this reserve could be so cashed-up? It was like Disneyland in the bush! Every view had a viewing platform, a convenient seat, a toilet or BBQ facilities. Sometimes all. Thankfully there was no bar selling margaritas otherwise we may never have experienced the thrill of Grill Cave, also known as The Tourist Cave. With such a name, our expectations were not high. In fact our expectations were so low that we hadn’t packed our helmets and only thought to detour to check it out to kill a bit of time before meeting Tony, Julie and Jeremy for the evening’s BBQ. We arrived at the cave, clearly identified by the grill door, and from the moment we entered we were enthralled. As experienced members of SUBW, we had all packed our headlamps, so lighting was not an issue. We tentatively edged forward admiring the silvery shimmer of the silica. It was almost irresistible; we wanted to explore this amazing place. It took every ounce of willpower to leave the cave and head back to the campsite to retrieve our helmets. We quickly set up camp, left notice of our intentions and hurried back to the cave as the sun was setting. I was the first one in ducking my head under and then reeling back as startled bats flew past me and out the exit. The cave is is closed in December: the bent-winged bats need some privacy for their breeding cycle. We assembled in the large chamber and pulled out the Grill Cave map, which came with the Under Bungonia book purchased earlier at the Rangers Station. It was our first time looking at a caving map but we quickly got the gist of it. Mary set off, leaving us trailing in her path. We marveled at the cave formation, descending lower and lower, periodically checking for foul air. The cave is very easy to navigate, there are ladders and safety rails, which hark back to the time when cavers wore suits and carried candles. We descended a ladder bridge, squeezed under and around boulders and then had the option to crawl commando style through a tunnel or climb up a ledge and do likewise. We decided to leave that for another day and made our way back to the surface. It was incredible how sweet the fresh air felt as we ascended. All agreed it was a sensory overload as we exited the cave to a stunning view of the night sky, brightly illuminated by the Milky Way. We headed back to the campground, full of excitement agreeing that caving was the perfect winter activity — warm and dry. What could be better? How about BBQ facilities, hot showers and a kitchen equipped with a gas heater and hot water? Tony, Julie and Jeremy arrived and we prepared a great BBQ. As we were tucking in, Julie pointed out what a multi-cultural group we were. We had an Italian, Fin, North American, Czech, Japanese and a Swiss — with a German and one more Aussie to arrive in the morning. In the cuisine stakes, our Swiss was the clear winner. Jeremy had prepared the best brownies ever! Apparently it’s the combination of Swiss chocolate and Australian brown sugar. Delicious. Next morning we car shuffled from the Ranger Station to the start at the junction of the Trestle Track and Stan Jones Trail. After about an hours walk-in, we reached the first short abseil and then after a 5 minute jaunt we reached the main abseil, 56m. It was breathtakingly beautiful, with a view across the entire gully. There were broad smiles all round and everyone was keen to descend and bask in the view! 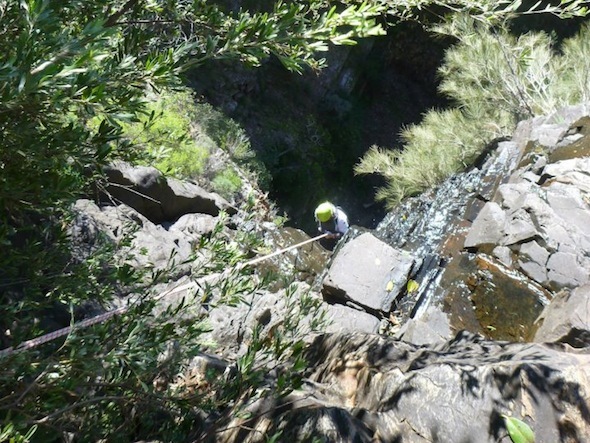 After that it was a succession of shorter abseils ranging from 4 to 22 metres, creek hopping and scrambling. We had a fairly good pace and made it to the river in time to catch the sun for a late lunch (and sour squirms), then it was time for the walk out. There are two options, the quickest being the steep exit opposite Fordham Gully or a more gradual exit further downstream via the Trestle Track. Naturally, everyone opted for the steep and fast route — which featured a lot of loose rock and scree. Helmets seemed like a good idea. I never enjoy these walk outs but Vicky reminded me that we had to earn those great abseils, which brought a smile to my face. We popped out on the Stan Jones trail, then it was just a short walk back to the cars. There was praise all round for Todd’s navigation skills. All in all, I’d recommend Bungonia as the perfect place for a winter weekend.